South Africa, Free State region, isolated stronghold to the dwindling Afrikaans white ethnic minority culture. In this conservative farming territory obsessed with strength and masculinity, Janno is different, secretive, emotionally frail. One day his mother, fiercely religious like the whole family, brings home Pieter, a hardened street orphan she wants to save, and asks Janno to make this stranger into his brother. The two boys start a fight for power, heritage and parental love. The film got a standing ovation at its debut in Un Certain Regard at Cannes. In the lead as Janno,beefy and rugby-playing but soft-faced youth Alex Vermeulen is a feat of perfect casting, and as his sudden opponent Pieter, Alex van Dyk isn't far behind. 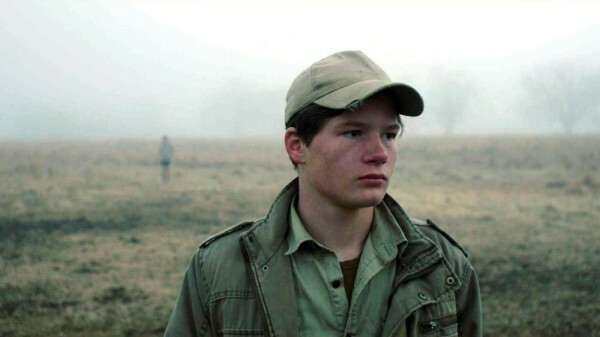 The Greek-descent director, who grew up in the Free State, and has won awards for shorts, returned home for this moody debut with its unique grand, harsh landscape and minimal music. This strange world reminded me of Carlos Reygadas' Silent Light (NYFF 2007). For some background see here; for aVariety review by Guy Lodge, here.